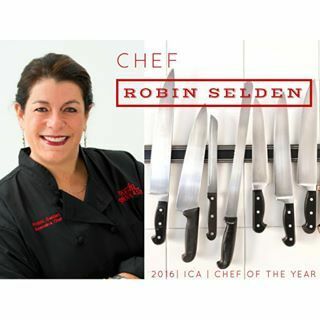 Robin Selden is the Managing Partner & Executive Chef of Marcia Selden Catering & Event Planning, the” it” caterer of Connecticut for nearly 38 years, orchestrating premier parties and weddings throughout the tri-state area; cooking for commanding companies, countless celebrities, and political dignitaries including 3 former US Presidents. They have offices and operations in Stamford & Greenwich Connecticut as well as an office, kitchen and venue in New York City. Robin is the current International Caterers Association President and was named their Chef of the Year in March at the Catersource conference. She was also named as one of the Innovative Chefs of 2016 at the Greenwich Food & Wine Festival and was the only catering chef and the only woman chef.